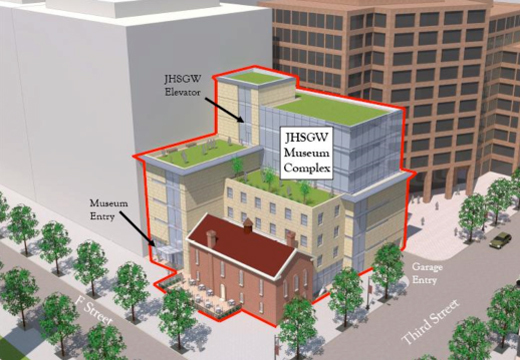 The Jewish Historical Society of Greater Washington’s ‘Lillian and Albert Small Jewish Museum’ is becoming a large component in Capitol Crossing’s 2.2 million gsf multi-phase mixed-use development. The museum will be housed in a new seven-story, 50,000 gsf above ground building connected to its original home, The Adas Israel synagogue, built in 1876. In the late 1960’s, TCE provided the design to move the synagogue three blocks away from its original location. Now working with the moving company in charge of relocating the building to its future home next to the new 7-story museum, TCE is designing the connection details to attach the buildings. The newly formed museum complex will provide much more space for future exhibitions. The Capitol Crossing development will also include four office buildings, one residential building, 63,000 gsf retail space, and five-levels of below grade parking for 1,146 cars and 440 bicycles. The development is being designed over US I-395 on a seven acre site covering three city blocks.